The young Jaguars are their own worst enemy in road loss to Tigers in Pacific Conference opener. In the wake of the Century Jaguars' 2-1 start that included wins over the Metro League's Mountainside and Jefferson of the PIL, things haven't gone quite so smoothly in recent weeks, as the Jags have dropped three straight, including a 56-35 loss to Newberg, Oct. 5, at Newberg High School. Century got behind early, failed late on a couple early possessions, and again were forced to watch as the opposition celebrated a win at the Jaguars' expense. "Our expectation is to score every drive or every other drive, and we didn't do that early," said Century head coach Sean McMenomy. "They didn't do anything we didn't expect, we just couldn't make the throws and catches early. They executed perfect. Hats off to them. They played a great game, they gashed us, and we had some costly fumbles and picks that showed our immaturity and youth." Coming off a 28-24 loss at Reynolds, Newberg knew they had little wiggle-room when it comes to their hopes for the postseason, and due to such approached their Pacific Conference opener with a bit more vigor than they have in some of their early season losses. "Talking to the kids about going into league, every week is a playoff game," Hastin said. "Our goal is to make the playoffs, so every week is big. I noticed a difference in intensity out of the boys tonight. They were fired up. They had a great week of practice." The Tigers were turned away on their first two possessions in the first quarter, but returned the favor with a turnover on downs at their own 37-yard line with 2:34 left in the first quarter. On the very next play, senior running back Matthew Larson went untouched around the right side and raced for a 63-yard touchdown to get Newberg on the board. In all three of their victories, the Tigers have gotten out to an early lead and they followed that script again after recovering a fumble on the ensuing kickoff. Four plays later, fullback Lawrence Lundgren powered into the endzone from 6 yards out to make it 14-0 with 33.9 seconds left in the opening quarter. Century put together a promising drive in response, moving the ball to the Newberg 16-yard line, but once again turned the ball over on downs. 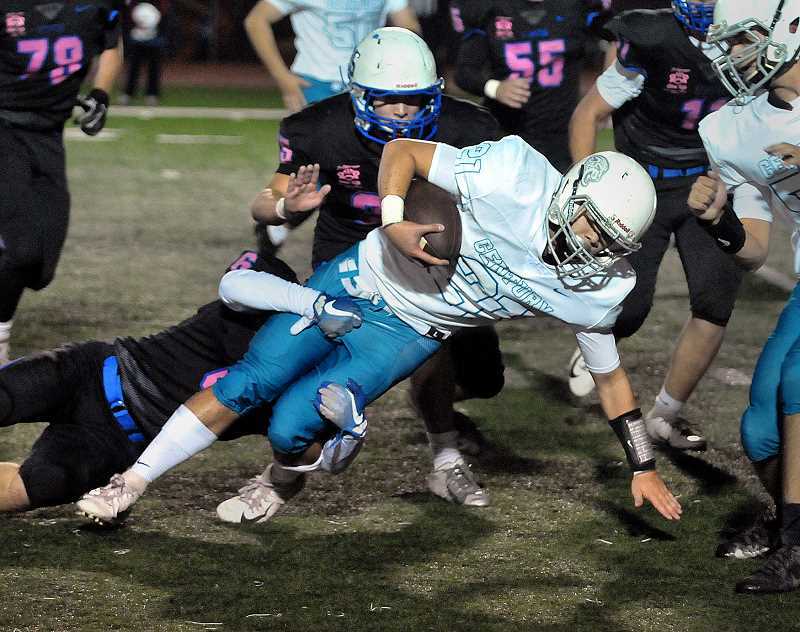 After each team traded punts, run-heavy Newberg landed a big blow in the passing game, as senior quarterback Gage Wright hit running back Justin Holtan on play-action for a 70-yard touchdown to make it 21-0. "It was a fake handoff to Matthew and Justin ran a wheel route on the back side," Wright said. "They were in man coverage and there was nobody close to him. It's awesome, especially with us passing like eight times a game. I loved it." Century finally broke through on its next drive, as junior wide receiver Chance Sparks turned a 20-yard reception into a 76-yard touchdown by breaking a tackle and racing down the sideline to make it 21-7. Newberg answered right back to make it 28-7 on a 23-yard run by Larson, but really put a stamp on the game when Armen Tarakhchyan intercepted Jaguars quarterback Jack Wilson near midfield and returned it to the Century 6-yard line. Holtan scored on the next play to make it 35-7 with 1:20 to play, but that proved to be just enough time for the Jaguars to drive the length of the field, as Wilson hit Shane Neal for a 27-yard touchdown with four seconds remaining to bring the score to 35-14 at the break. It seemed like things were turning at the time, but ultimately it was more of the same to start the second half, as Century failed to take advantage of opportunities to seize momentum and watched as the Tigers pulled further away, leaving the young Jags to again wonder what could've been. "Chance (Sparks) got hurt in the first week and it's taken some time to get the rhythm back," McMenomy said. "We're starting to get in rhythm, but it was missed opportunities. At the beginning of the second half, we can't go three drives without scoring. You just can't do that and put our defense in a bad spot. We have to learn from it and get better every week, every play. We're doing that. I know where we will be, but it's frustrating we're not there yet." After forcing another turnover on downs to open the second half, Newberg went on another scoring spree, stringing together three touchdowns in less than four minutes to make it 56-14 late in the third. Lundgren scored the first of that trio on a 1-yard run and defensive end Tristan Price got the ball back for Newberg with an interception on the Jaguars' next play. Larson later scored on a 5-yard run and following Price's second interception of the night, the speedy senior broke free for his fourth touchdown of the night, this time from 70 yards out. "Credit to our offensive line," Hastin said. "They were opening holes and we had a nice play-action pass for a touchdown. It's great seeing more than one guy producing. It took a couple drives to figure what they were trying to do. If they're going to try to take Holtan away, Lawrence and Matthew have to step up and they did that today. It was a good win." Century did add three fourth-quarter touchdowns, but it was simply too late. 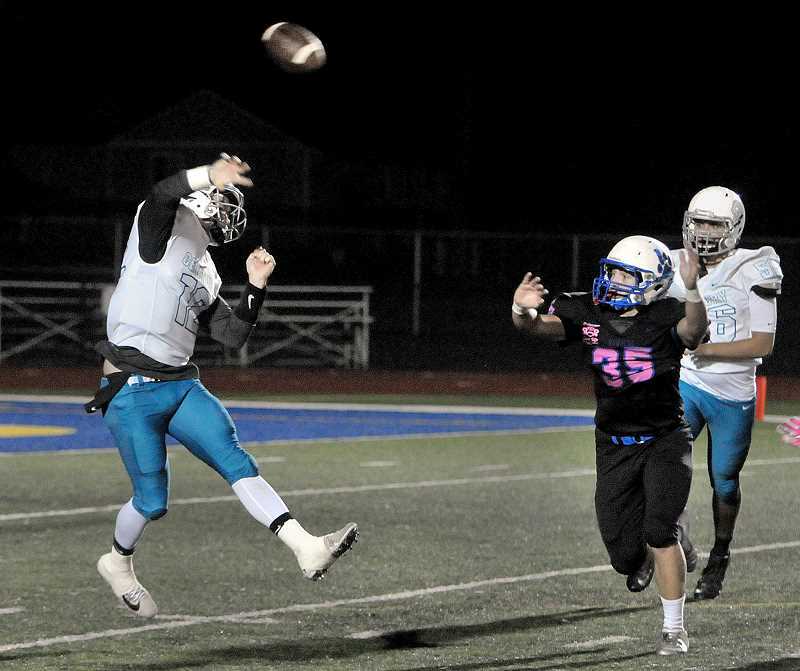 Quarterback Jack Wilson and Sparks were a potent combination and finished with gaudy stats, as the quarterback threw for 512 yards and five scores, but also tossed four interceptions. Sparks caught four touchdowns on the night. But despite the late production, it continues to be the self-inflicted wounds, along with breakdowns defensively that are costing Century, seemingly on a weekly basis. "Defensively, we just have to get better," McMenomy said. "We had a lot of breakdowns and showed our youth. We have to keep on taking reps and keep on getting these young kids better. We know down the road where we'll be." And where they'll be, hopefully, is more experienced and better equipped to produce on a more consistent basis. "It was another great growing experience for the kids," McMenomy said. "We knew this was a process. As frustrating as it is sometimes, we know it's another step in the process and these guys are learning. We're better this week than we were last week, and we'll be better next week. We're just building on through the rest of the year." Century (2-4, 0-1) will return home to face Liberty (4-2, 1-0), Oct. 11, while the Tigers will travel to play Sherwood, which is the favorite to win the league despite going 1-4 against a brutal slate of nonconference opponents before winning it's Pacific Conference opener over McMinnville 38-27.